UNCOMPROMISED CARE® – TriNova’s Butcher Block Conditioner contains a powerful formula that ensures your butcher blocks, cutting boards and countertops remain both beautiful and functional-the way they were meant to be. 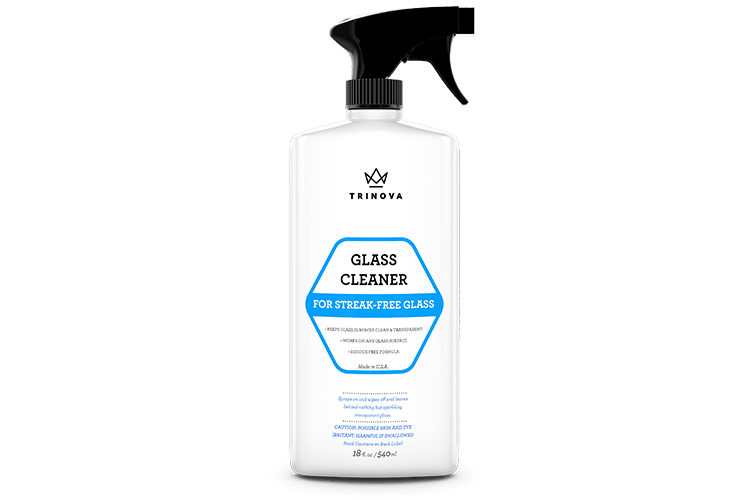 This conditioner helps you enjoy the natural look of wood while also extending the life of your investment, providing the Uncompromised Care® TriNova is known for. FOOD GRADE APPROVED – This wood conditioner has received full food grade approval, which means it’s safe for use on surfaces that often come into contact with food before, during or after preparation. 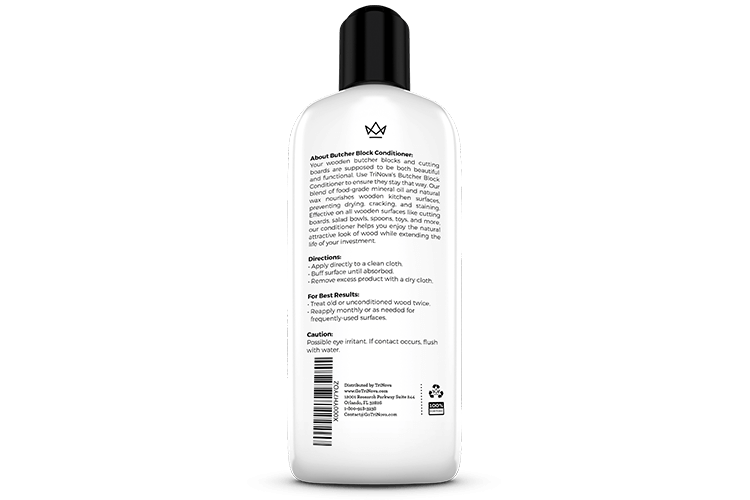 This product contains no harmful ingredients or elements that might leave behind any sort of stickiness or residue. 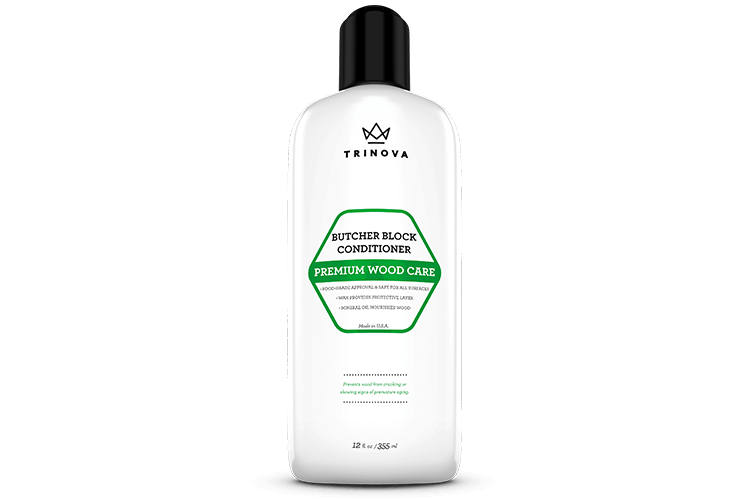 NATURAL INGREDIENTS – TriNova’s Butcher Block Conditioner uses food grade mineral oil and carnauba wax to offer lasting protection on even the most heavily used cutting surfaces. These ingredients work together to condition and protect simultaneously to keep your butcher block from drying out, cracking or staining in the future. SAFE ON ALL WOODEN SURFACES – Butcher blocks aren’t the only wooden surfaces you have in your home, which is why TriNova has designed this conditioner to work well on anything made out of wood. This means you can use it on salad bowls, wooden spoons, toys and more to give these products the same deep conditioning treatment. 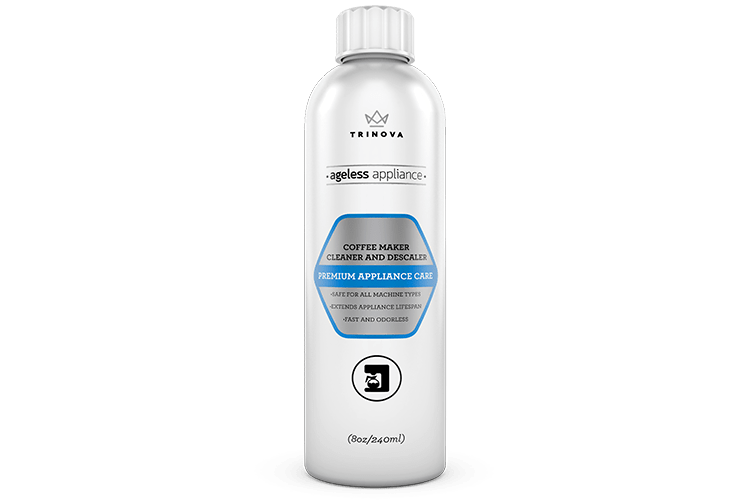 EASY APPLICATION – TriNova’s Butcher Block Conditioner features easy application to ensure you get the results you want without any hassle. Simply rub the product into any applicable surface and wipe off whatever remains. It’s that simple. Apply an even coat to wood surface. Allow up to 24 hours for conditioner to absorb into wood. Buff excess with a clean cloth. New or untreated surfaces may require two applications. TriNova® Butcher Block Conditioner is rated 4.0 out of 5 by 4. Rated 5 out of 5 by Debra Trump from Butcher's Block Conditioner So.....I didn't really know that there was a "conditioner" for your butcher block. However, this was an incredible first sample for me. My kitchen countertop is butcher block, and it was showing years of wear. The conditioner "woke" it up again.....it is not exactly perfect but it is beautiful and looks amazing in my kitchen. I am extremely pleased with the results I received. Rated 4 out of 5 by Diana from Great Product For Tables I received this product for free in exchange for my honest review. It worked great for wood table and tv table. The only complaint that I have is when you first opened, it does squirt out a little. Not a big deal, but it is really great for my wooden surfaces. Rated 4 out of 5 by Mini from Super easy to use Just got my Butcher Block Conditioner today. I was super at easy to apply. I especially like the smell of it, NONE, there is no strong odor at all! !